Do you believe God put more effort into making others than He did into making you? 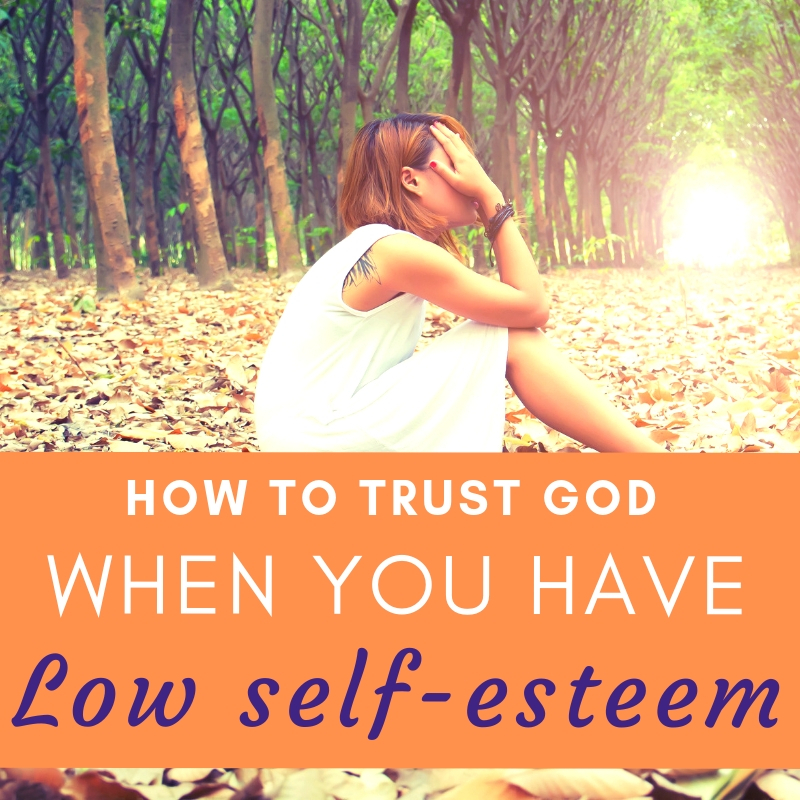 Most of us who’ve dealt with low self esteem often blame God for the things we hate about ourselves. We find it hard to trust God. One day I wrote a list of all the things I didn’t like about myself and it filled up my page. I then tried writing a list of all the things I liked, or at least didn’t mind about myself, and I could only come up with 3 things… T-H-R-E-E. I was so angry with God because I didn’t have the body or the personality I wanted. I forreal believed He was asleep when He made me. You couldn’t convince me that He didn’t put more effort into making other people than He did me. And honestly, how do you trust a God that you believe jipped you? Let’s keep it funky, it’s hard to do. The worst feeling is knowing that in order to move forward you need the help of a God that you don’t know how to trust. It can be frustrating and discouraging. I’ve been there and I’m grateful that God brought me out of that place. I’m going to share the lessons I’ve learned with you and I hope they help you learn to trust God more. Before we get into the nitty gritty, here are some mindset shifts you’ll want to make. 1. Be willing to give God the benefit of the doubt. It can be easy to only see the ways in which you feel God has let you down. It’s human nature… when you don’t trust someone, you’re always looking for signs that they’re gonna let you down again. The downside is that if you view God this way, it makes it hard to build a relationship with Him. If you can’t build a relationship with Him, you’ll find it hard to start trusting Him. So to move forward in your relationship with God, you need to give Him the benefit of the doubt. To clarify, God is good, Holy, and perfect. He doesn’t need you to give Him the benefit of the doubt. Here’s the problem … our view of Him can become skewed because of the crappy stuff that’s happened to us. We begin to blame God for all the stuff we don’t like in our lives. So for our sake, we have to shift our view of Him so we can see the truth of who He is. So, how do you give God the benefit of the doubt? Be willing to ask questions that help shift your perspective of Him. There are things about God’s goodness or His grace that I may not have noticed? I could see my future and see how my purpose in life connects to everything I’ve been through? God’s using the lessons I’m learning to give me a future better than I’ve ever imagined? Fact Check: We’re only human. We can’t see the end from the beginning and we don’t have all the answers. But, if you will choose to start looking for the evidence that God is on your side, your view of Him will change. He may not show up in the way you want, but He’ll show up in the way you need Him to. Earlier this evening I spoke with someone I’m counseling. She was sooo angry at God because of an experience she had on a prayer call. I can’t give details, but someone prayed for her. Something the person said in the prayer upset her because she saw it as evidence that God doesn’t love her. That experience made her so angry that she tore up her Bible. When we spoke, I showed her Matthew 6 where Jesus teaches about prayer. I showed her that the same prayer that made her angry, Jesus Himself actually prayed. She realized that what she perceived as proof God didn’t love her, was actually evidence of His love for her. She realized that she’d wrongly accused God because she misinterpreted the prayer. Instead of stopping to own up to the fact that she was wrong, she brushed past it. She never stopped to apologize to God or to own up to the fact that she was wrong. Once you start giving God the benefit of the doubt, you’ll notice when you’re accusing Him unfairly. When that happens, own up to it and apologize. Part of moving forward is being able to admit when you fall short. It creates a space for you to acknowledge the goodness of God. And when you can start acknowledging God’s goodness towards you, you’ll trust Him more. Think about how you behave in a relationship that you want to be successful. I know what it’s like to be angry at God, but take a look at how you’re treating Him. 👉Overlook the good things He’s done for you? 👉Hyperfocus on the things you don’t like while ignoring the things you should be grateful for? Answer those questions honestly. Then choose to treat God with the same grace you’d treat the most important person in your life. For any relationship to flourish, you have to be willing to put in the work. My prayer for you is that your relationship with God will become the best relationship you have. Be honest… what do you really believe about God? What do you believe about His character? For me, my biggest issue was I believed He had favorites and I wasn’t one of them. All I wanted was to feel loved by Him and I didn’t. And let’s be clear, that made me very angry with God. That made it hard to obey Him, worship Him, read my Bible, and ultimately love Him. I couldn’t move past that without changing how I saw Him and what I believed about Him. I created (and committed to) new beliefs about God. 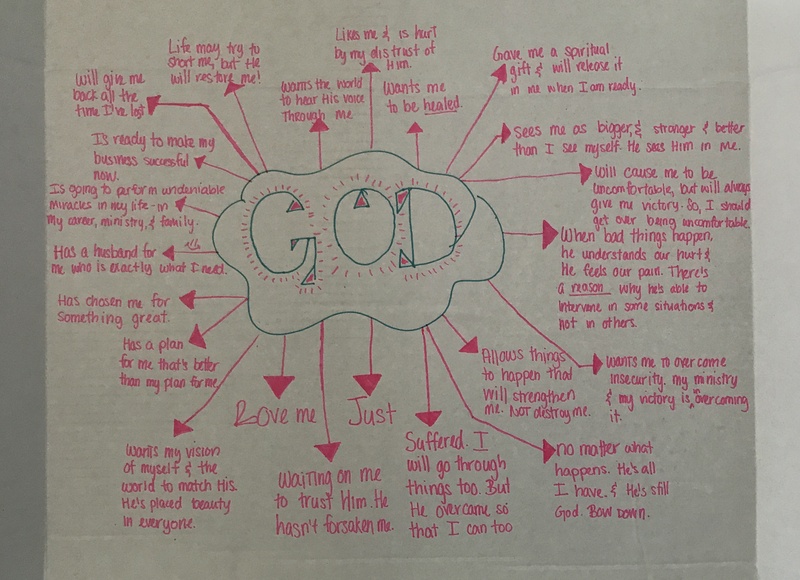 I found an old poster board, wrote “God” in the middle of it, and the things I was going to choose to believe about Him. Let me tell you. This. Changed. My. Life. I was able to see God in a different light. Overtime, I stopped seeing Him as some evil stepfather who didn’t care about me. I was able to fall in love with Him. It didn’t happen overnight, but it did start with those small steps. If you want to try the activity I did (and I think you should), do the Day 2 Challenge at the end of this post. 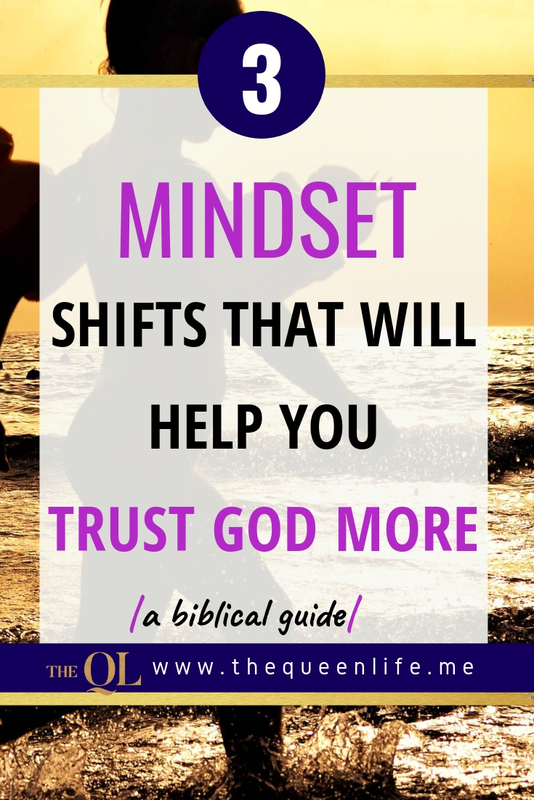 So you’re working on shifting your mindset and changing your beliefs about God. Awesome sauce! Feels good, right? The same thoughts that made you feel insecure will come raging war against your mind. That’s when you should be asking this question… What’s the truth? There’s a difference between your reality and the truth. Your reality is defined by your circumstances, your feelings, etc. For example, your reality may be that you don’t feel loved by God. But, the truth is that God loves you and nothing can separate you from His love (Romans 8:31-39). For starters, you acknowledge how you feel. If the answer is “no,” (and it likely will be) then make a choice. You can either choose to bring those feeling to God in prayer (2 Corinthians 10:5) and to reaffirm the truth of His word. Or you can choose to give in to those negative thoughts and feelings. 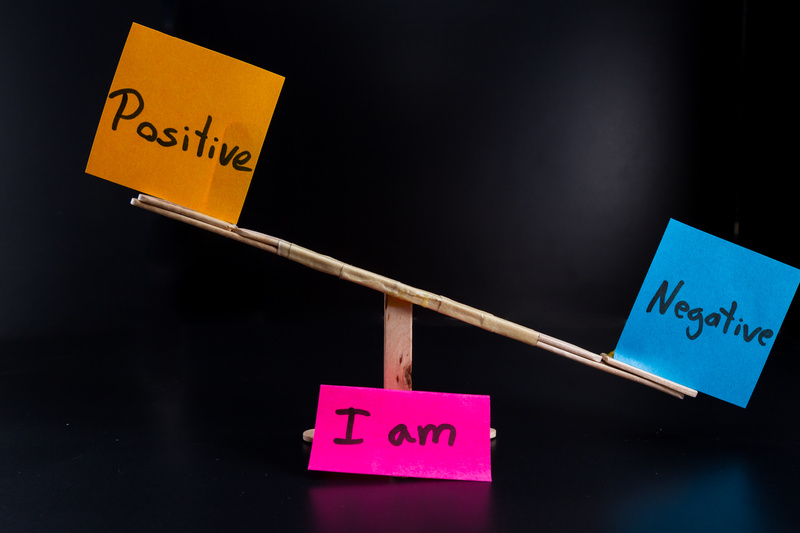 You can choose to meditate on the negative thoughts, which will only make you feel worse. I wouldn’t advise that though. Hint: You know how the Bible talks about renewing your mind? (Romans 12:2) This is one of the ways you do it. You actually get to choose whether to focus on God’s word or the things that contradict it. If you’re struggling to make the right choice, remember what we said on Day 1. Remember you’re reason to fight. 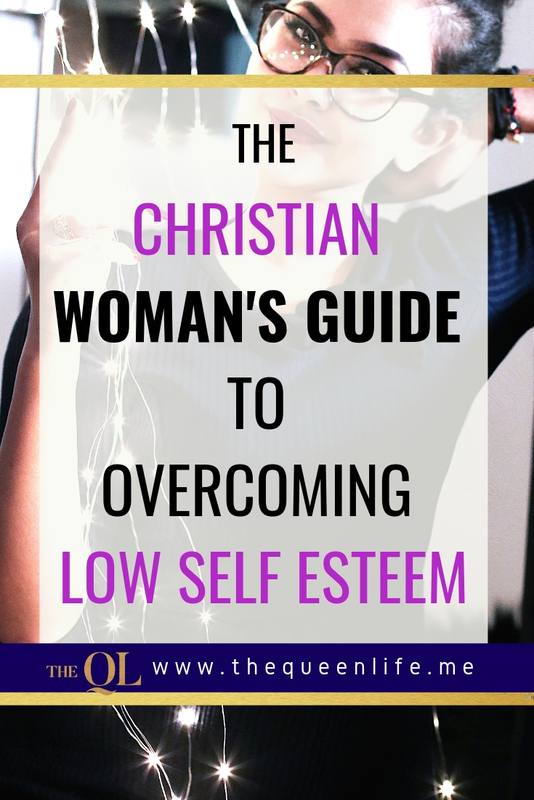 If you’re okay with being insecure and having low self-esteem, then give in to your reality. All the above will force your mind to focus on God instead of those negative thoughts and feelings. Do this consistently and overtime you’ll notice that your mind is being renewed. The same negative thoughts that used to make you feel insecure, won’t have the same effect on you. You’ll start to experience more and more freedom. But it all starts with a choice. Only YOU can choose to move forward. Only YOU can choose to do the work of renewing your mind. If you make the right choice, insecurity and low self-esteem will have no choice but to let you go. You can do this Queen. There’s a God in Heaven who loves you and who’s worthy of your trust. 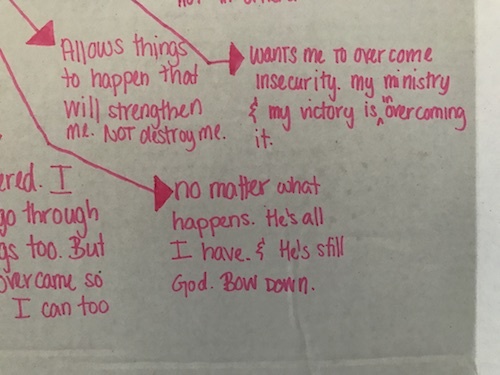 Write down your current beliefs about God on a sheet of paper. 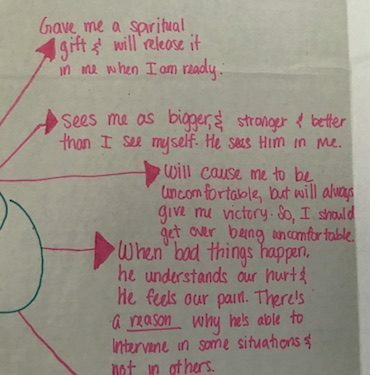 Get a new sheet of paper or poster board and write down the new beliefs you’re choosing to have about Him. Meditate on those new beliefs D-A-I-L-Y. Pray for guidance and wisdom as He Leads you into a new relationship with Him. This week when negative thoughts come, choose to fight. If you haven’t checked out our Day 1 challenge, start there. Remember to subscribe so you get notified when Day 3 Challenge drops. It is so hard to understand why some people have so many bad things happen to them. That has always been one of the difficult things to wrap my mind around. Thank you so much for your guidance to understanding that God truly does love us, and His love is equal. EQUAL for all people. God bless you! I know what you mean! I’m reading the book of Job now and I’m reminded of how challenging it can be to see God’s love for you. Separating our feelings from the truth of God’s love is so critical in our walk with Him. Thanks for reading Janene!